Pressure washers are mechanical spraying devices used to clean dirt particles from the floor or hard surfaces. Pressure washers are extensively used in the residential, commercial, and industrial segments. Pressure washing has a significant role in heavy industries, as it helps to increase the production capacity and efficiency of the industries. Increasing commercial services such as car washing, floor cleaning, maintaining swimming pools, and gardening are expected to fuel the demand for consumer pressure washers during the forecast period. Increasing number of vehicles will boost the demand for consumer pressure washers from residential consumersUnlike traditional method of washing, consumer pressure washers are highly efficient and are able to reduce considerable wastage of water. This helps in addressing the global water crises and is expected to increase demand during the forecast period. New and innovative product developments such as solar pressure washer, fuel and diesel pressure washer, modification of old products in order to increase their capacity; and tapping untapped markets will boost the demand for pressure washers during the forecast period. However, high price of pressure washers hampers the growth of the consumer pressure washer market. Nevertheless, rising standard of living, increasing disposable income, and growing demand for standard goods and commercial services is projected to drive the market growth over the forecast period. Increased availability of enhanced versions of consumer pressure washers in a range from 1500-4500 psi is also anticipated to drive the market growth. The consumer pressure washer market is segmented based on product type, application, and distribution channel. Based on product type, consumer pressure washers are segmented into electric, gas, and others (solar pressure washer, petrol, and diesel pressure washer).Electric pressure washers are affordable and user-friendly. They are compact and can be carried anywhere; these pressure washers need to connect with power to operate. Electric pressure washers are expected to have the highest CAGR during forecast period. Gas pressure washers have the highest demand from the commercial segment due to their heavy capacity ranging from 2500-4500psi. Automotive, construction, and other industries use gas pressure washers at a significant rate. Increasing number of industries and growth of the automotive sector is projected to drive the gas pressure washer market during the forecast period. The others category includes petrol, diesel, and solar pressure washers which are in high demand in the industrial sector. Petrol and diesel pressure washers are expensive and have high operating cost. Hence the demand for such washers is low in the residential segment. Based on application, the consumer pressure washer market is segmented into residential, commercial, and industrial. Residential and commercial segment is expected to have highest CAGR during the forecast period 2016-2026. Based on distribution, the online distribution channel will show significant growth during the forecast period due to increasing digital technology and usage of mobiles. E-commerce platforms such as Alibaba, Amazon etc. are likely to exhibit high growth rate due to the wide variety offered by them coupled with numerous offers. North America holds major share in the global pressure washer market due to increasing growth of building exterior cleaning industries. 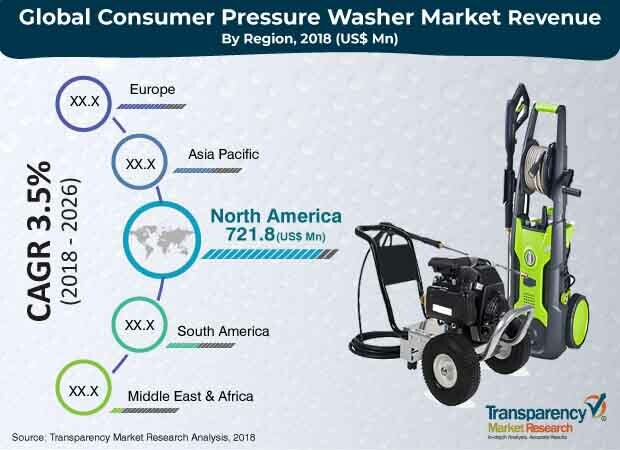 Europe holds second position in growth rate for consumer pressure washers due to improving lifestyle and infrastructure.Growing industrial and agriculture sector is expected to fuel the demand for consumer pressure washers in Europe. Asia Pacific is expected to have the highestmarket share in terms of revenue for consumer pressure washers during the forecast period. The growth in the region is attributed to the rising demand for consumer pressure washers in emerging economies due to increasing disposable income. Additionally, the increasing trend of e-commerce with rising purchasing power of consumers is also projected to boost the market growth over the forecast period.Middle East & Africa is likely to have lower CAGR during forecast period due to absence of water bodies. Some of the major players in the global consumer pressure washer market are Karcher, AR North America, Snow Joe, FNA Group, Nilfisk, and Clearforce etc. This report on the global consumer pressure washer market provides analysis for the period 2016–2026, wherein 2017 is the base year and the period from 2018 till 2026 is the forecast period. Data for 2016 has been included as historical information. The report covers market dynamics including drivers, restraints, opportunities, and trends that are expected to influence the expansion of the global consumer pressure washer market during the said period. The study provides a comprehensive analysis on market growth throughout the above forecast period in terms of value estimates (US$ Mn) and volume estimates (‘000 Units) across different geographies. The growing global car washing industry is projected to increase the demand for consumer pressure washers in automobiles and for residential purposes. Unlike conventional washing systems, consumer pressure washers are capable of reducing the wastage of water due to its high efficiency. Therefore, consumer pressure washers are addressing the global water crises, resulting in increased adoption of consumer pressure washers. Availability of various substitutes such as foam based cleaning and sandblasting in industrial cleaning equipment is hampering the growth of the market. Consumers are shifting toward substitutes, as consumer pressure washers are expensive. High price and availability of substitutes is hampering the growth of the market. The study provides a conclusive view of the global consumer pressure washer market by segmenting it in terms of product type, application, and distribution channel. In terms of product type, the consumer pressure washer market has been classified into electric, gas, and others. The others category includes petrol, diesel, and solar pressure washer. Based on application, the market has been segmented into residential, commercial, and industrial. Based on distribution channel, the consumer pressure market is segmented into online and offline. The analysis of the above segments is based on present and forecasted global demand for consumer pressure washers and prevailing and future trends in the market. We have analyzed the present and estimated regional market size of consumer pressure washers across North America, Europe, Asia Pacific, Middle East &Africa, and South America. The regional consumer pressure washer markets are further broken down into country level markets in the following geographies: the U.S., Canada, U.K., Germany, France, Italy, China, India, Japan, and Brazil. The report highlights key developments in the consumer pressure washer market. Porter’s Five Force Analysis, which identifies bargaining power of suppliers, bargaining power of buyers, threat from new entrants, threat from substitutes, and degree of competition is also included in the report. Value chain analysis shows work flow in the consumer pressure washer market. Incremental opportunity analysis identifies and compares attractiveness of segments on the basis of CAGR and market share index across North America, Europe, Asia Pacific, Middle East & Africa, and South America. The report includes competition landscape, which covers competition matrix, market share analysis of major players in the global consumer pressure washer market based on their revenues, and profiles of prominent players. The competition matrix benchmarks leading players on the basis of their capabilities and potential to grow. Factors including market position, offerings, and R&D focus are attributed to a company’s capabilities. Factors such as topline growth, market share, segment growth, infrastructure facilities, and future outlook are attributed to a company’s potential to grow. This section also identifies and includes various recent developments and strategy of leading players in the consumer pressure washer market. Company profiling includes company overview, major business strategies, and key developments. Companies profiled in the global consumer pressure washer market include Karcher, AR North America, Snow Joe etc.